Partitioned Scoop Dish With Lid For One Handed Eaters. 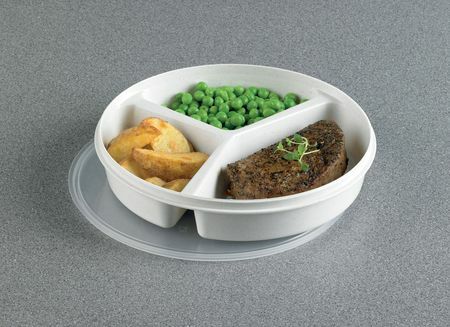 Suitable for elderly people as well as children, this white melamine partitioned dish makes it easy to assess appropriate portions. This can be useful when trying to maintain a balanced diet. The high dividers and near vertical sides make it easy for the user to scoop food onto their spoon or fork without the need for a knife, useful for one handed eaters. The two smaller sections hold up to 200 ml, while the larger one has a 375ml capacity. The high walls of each compartment can be used to push food onto forks and spoons. Supplied with a clear plastic lid for easier transporting and storing of food.